Police were made aware of a black BMW estate after it was reported stolen from a house in Milton Road, Worthing, in the early hours of Thursday, police said. The address had been entered and the keys to the vehicle stolen from within. Automatic number plate recognition cameras showed the vehicle was driven back and forth between Worthing and Chichester from 3.30am onwards. It was also involved in a theft of fuel in Littlehampton at around 5.15am. It was later reported to police as stolen, and shortly after 9am the vehicle was spotted on the A259 westbound, near Climping. It was pursued by officers onto the A29 Shripney Road, Lidsey, where it crashed. The occupants got out of the car and ran from the scene, and three people were detained and arrested nearby shortly afterwards, police said. A 17-year-old boy from Croydon, arrested on suspicion of theft of a vehicle, drink-driving, burglary, dangerous driving and making off without payment, has been released under investigation. 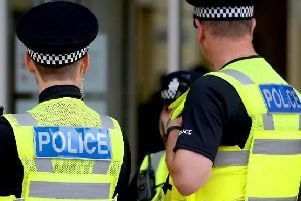 A 16-year-old boy from Worthing, arrested on suspicion of theft of a vehicle, drink-driving and burglary, has been released under investigation. A 25-year-old man from Bognor Regis, arrested on suspicion of theft of a vehicle and burglary, has been released under investigation. Detectives are appealing for anyone who witnessed the burglary, or anyone who has dash cam footage which may assist in identifying the driver of the BMW, to get in touch. You can report it online or call 101 quoting serial 154 of 04/04. Alternatively, you can visit the Crimestoppers www.crimestoppers-uk.org website or contact the independent charity anonymously on 0800 555 111.